UPSC Notification is out. 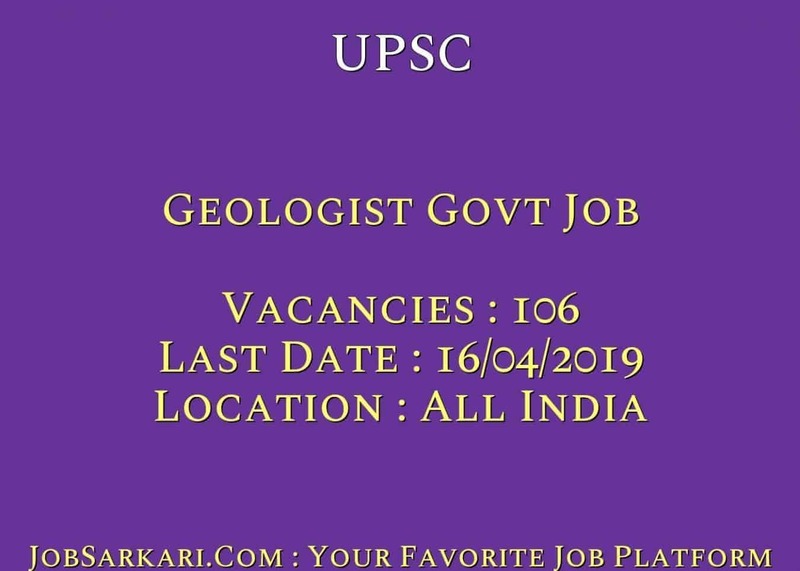 UPSC is recruiting for 106 Geologist Govt Job Posts. You can check UPSC - Union Public Service Commission last date, download UPSC notification, visit UPSC official website and check other UPSC Vacancy details.Complete Vacancy and recruitment Details about 106 Geologist Govt Job vacancies in UPSC are provided below by JobSarkari.Com only for you. Date of Admit Card. June 2019. SC / ST / Female / PH. No Fee. Mode of Payment Application fee Can be Submitted through Online Mode or Offline through E-Challan Making Payment at Any Branch of SBI. Geologist Group A Candidate Must Have Passed Master’s Degree in Geological Science/ Geology /Applied Geology / Geo Exploration / Mineral Exploration / Engineering Geology / Marine Geology / Earth Science and Resource Management/ Oceanography and Coastal Areas Study / Petroleum Exploration / Petroleum Geoscience/ Geochemistry /Geological Technology / Geophysical Technology. Mini 18 and Max 32 Years. 50. Geophysicist Group A Candidate Must Have Passed M.Sc.in Physics / Applied Physics / Geophysics or Exploration Geophysics / Applied Geophysics /Marine Geophysics or M.Sc. Tech. in Applied Geophysics. Mini 18 and Max 32 Years. 14. Chemist Group A Candidate Must Have Passed Master Degree in Chemistry/ Applied Chemistry / Analytical Chemistry. Mini 18 and Max 32 Years. 15. Junior Hydro Geologists Candidate Must Have Passed Master Degree in Geology /Applied Geology /Marine Geology. Mini 18 and Max 35 Years. 27. Total No. of Post 106. 2. Candidate Need to Click on the Apply Online Link As Given on our Website in Important link Section. 4. Candidate Have to Upload the Scanned Copy of Documents in the Prescribed Size and Format as Mention in the Application Form. Q. What is the Last Date For UPSC Geologist Govt Job Vacancy ? A. 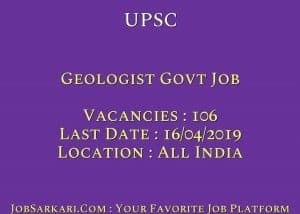 Last Date for UPSC Geologist Govt Job Posts is 16/04/2019. Q. What is the Form Type of UPSC Geologist Govt Job Recruitment ? A. The Form Type for UPSC Geologist Govt Job Posts is Online. Q. How many vacancies are available in Union Public Service Commission Geologist Govt Job Posts ? A. There are about 100 Vacancies in Union Public Service Commission Geologist Govt Job Posts. Q. What is the Full Form of UPSC ? A. Full Form of UPSC is Union Public Service Commission .